“If the good lord made anything better than lobster, he kept it for himself.” These words were told to a young lad from Stonington, Maine by his grandfather. Ed Blackmore grew up to be a lobstermen himself, as well as one of the founders of the Maine Lobstermen’s Association and the University of Maine’s Lobster Institute. This sentiment is behind the amazing growth of the lobster industry – since the first recorded lobster catch in 1605 to the current-day multi-billion dollar industry that saw a record 131 million pounds of lobster landed in 2016. Milestones in the growth of the commercial lobster industry center on transportation and technology. The real start of the industry came about when designs for smacks found their way from Europe to the U.S. in the late 1700s. Smacks were sailing vessels with tanks or wells in their holds that filled with seawater, which could then be used to keep seafood alive during transport. In the 1830s Elisha Oakes of Harpswell was the first Mainer to use smacks for transporting lobsters to ports in Boston and New York. 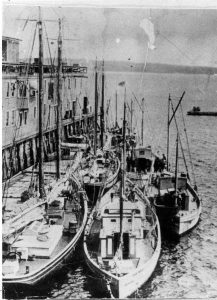 The Colwell family of Prospect Harbor, a site on the Downeast Fisheries Trail, were also in the smack business, carrying lobsters to Gloucester and other ports in Massachusetts. They were also one of the first to use lobster pounds for holding of live lobsters. Lobster Pound at TIdal Falls, a site on the Trail. 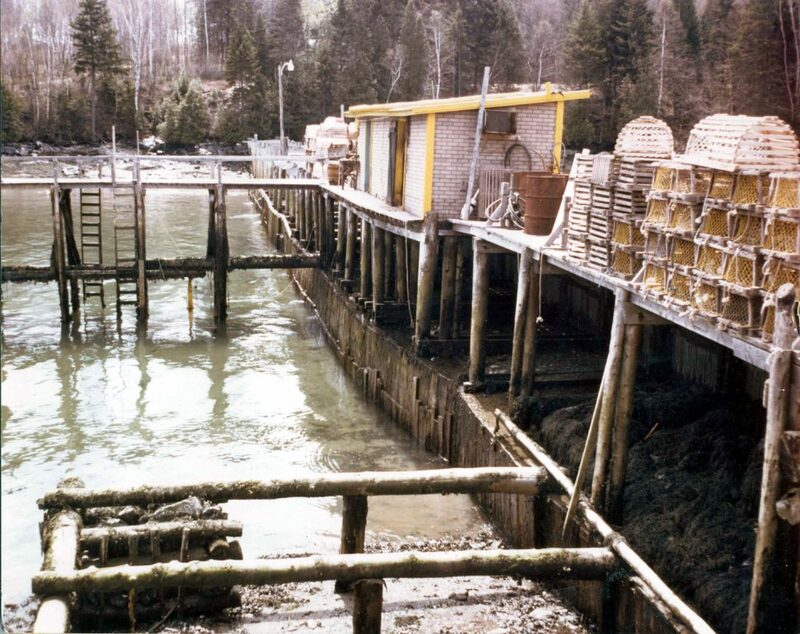 Building lobster pounds was another practice borrowed from Europe, where protected ocean inlets were blocked at their mouths by dams engineered to allow seawater to flow in and out with the tides; but keep lobsters placed within them from escaping to the open ocean. Pounding of lobsters allowed a lobster dealer to hold live lobster caught during times of low market demand, or when shells were quite soft, until the demand increased, the price was higher, and/or the lobsters were stronger for shipping. In addition to Prospect Harbor, Tidal Falls in Hancock is another site on the Trail that once housed a working lobster pound owned by the Hodgkins family. Herbert Hodgkins was the founder of the Maine Lobster Pound Owners Association. Many other sites on the Trail have rich lobstering histories, including Beals, Jonesport, and Milbridge which still have working tidal lobster pounds. Prospect Harbor is also home to the largest lobster processing plant in Maine, in buildings that housed one of the last sardine canning facilities in the U.S. 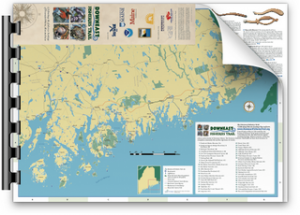 The Downeast Fisheries Trail is proud to help preserve some of Maine’s lobstering heritage. The Lobster Institute is a partner of the Trail and you can read more about the history of this industry in their book The Maine Lobster Industry: A History of Culture, Conservation and Commerce, by Cathy Billings.